OBE Not just an abbreviation for the Order of the British Empire, but an Out of Body Experience. Also called Astral Projection, this is a phenomenon in which a living person's spirit/soul can leave its body, travel on the astral plane to other spiritual worlds, and then return safely back to its body. Obeah & Wanga The terms Obeah and Wanga are African diasporic (the dispersion of a people, language, or culture that was formerly concentrated in one place) words that occur in Chapter 1, paragraph 37 of The Book of the Law. Obeah is a folk religion/magic found in the West Indies amongst those of the slaves of African descent. It is derived from central African Congo or Bantu sources and has a close North American parallel in African American magic or hoodoo. A wanga (oanga or wanger) is a magical charm packet found in the folk magic practices of Haiti, and as such is connected to the West African religion of Voodoo, which derived from the Fon people of Benin (formerly known as Dahomey until 1975). Crowley explains: "The obeah is the magick of the 'Secret Light' with special reference to acts; the wanga is the verbal or mental correspondence of the same. The 'obeah' being the acts, and the 'wanga' the words, proper to Magick, the two cover the whole world of external expression." Occult This word derives from the Latin 'occultus', meaning hidden or secret, in this instance meaning the 'hidden' or 'secret' knowledge of the paranormal, as opposed to knowledge of that which is measurable (normal). The term is often taken to mean knowledge that is meant only for a certain few, or knowledge that must remain hidden, but for most practicing occultists it is simply the study of a deeper spiritual reality extending beyond reason and science. Oil of Abramelin A ceremonial, magical oil blended according to the recipe found in Mathers' translation of The Sacred Magick of Abramelin the Mage, consisting of one part myrrh, two parts cinnamon, a half-part galangal (a root with a hot ginger/pepper taste used primarily as a seasoning in Thai cooking), and half the total weight of the best olive oil. Olam Ha-Ba In Jewish theology, either "the world after death" or the new creation or restoration of the world that is to follow the messianic millennium. The latter is a time to prove oneself worthy of participating in "the world to come." Omen An unexpected sudden occurrence or any phenomenon which can be interpreted as either a sign of good luck or one of misfortune. Oracle A person or agency considered to be a source of wise counsel or prophetic opinion; an infallible authority, usually spiritual in nature. In the ancient world many sites became known as oracles having gained a reputation for the dispensing of oracular wisdom, as did the oracular utterances themselves, whose name is derived from the Latin verb 'orare', meaning to speak. Orphic Egg The Orphic Egg, often called the Cosmic Egg, is represented as an egg surrounded by a coiled serpent, symbolising the belief in the Greek Orphic religion that the universe originated from within a silver egg. Osiris The Egyptian god of the underworld and judge of the dead. He was husband to his sister Isis and father of Horus. 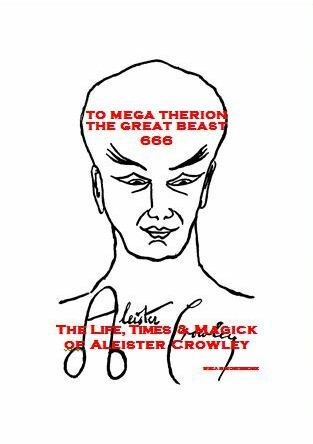 When Aleister Crowley received the Book of the Law from Aiwass in 1904, it brought the Age of Osiris to an end and ushered in the Aeon of Osiris. Ostara Ostara, the Spring equinox, is one of the eight Sabbats or holidays in the Neo-pagan festival calendar. It is held on or near 21st March to celebrate the return of life and growth to the earth. Ouija Board This is a small board, simple in design, on which the letters of the alphabet are inscribed along with the numbers 0 to 9; some may also bear the words 'YES', 'NO', 'GOOD BYE' and 'MAYBE'. The Ouija board is used to try to establish contact with the souls of the departed. Participants sit around a table, the focal point being the board in the centre of the table. They place their hands on a 'pointer' or 'inverted glass', then, should contact be made, the pointer or glass will move around the board spelling out answers to questions put to the spirit. See also Planchette. Ouroborus Ouroborus is a Greek word meaning tail swallower. The symbol is usually circular in shape and depicted in the form of a snake swallowing its tail. The Ouroborus had its origins in ancient Egypt as a symbol of the sun, and represented the travels of the sun disk. Out of Body Experience See OBE.